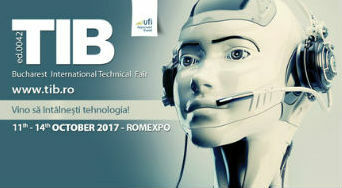 The TIB International Technology Fair is an important Romanian event, first held in 1970. Participation in TIB is an opportunity to familiarize oneself with interesting solutions for: laser technologies, robotics, multifunctional industrial machinery, hydraulics, and IT applications. The event is accompanied by conferences, seminars and workshops related to latest technologies, run by experts of various sectors. Please visit our stand B209! 11-13.10.2017: 10:00 a.m. to 6:00 p.m.
14.10.2017: 10:00 a.m. to 4:00 p.m.